Dave Brubeck (1920-2012) is most famous for his platinum-selling album Time Out, made in that year of jazz years 1959. His quartet with drummer Joe Morello, Eugene Wright and Paul Desmond blended cool and West Coast jazz with odd time signatures, resulting in the huge hits Blue Rondo à la Turk and Take Five. His son Darius Brubeck is now 71 and has made a career inspired by his father’s legacy as well as developing his own inspirations in particular during his years working in South Africa. 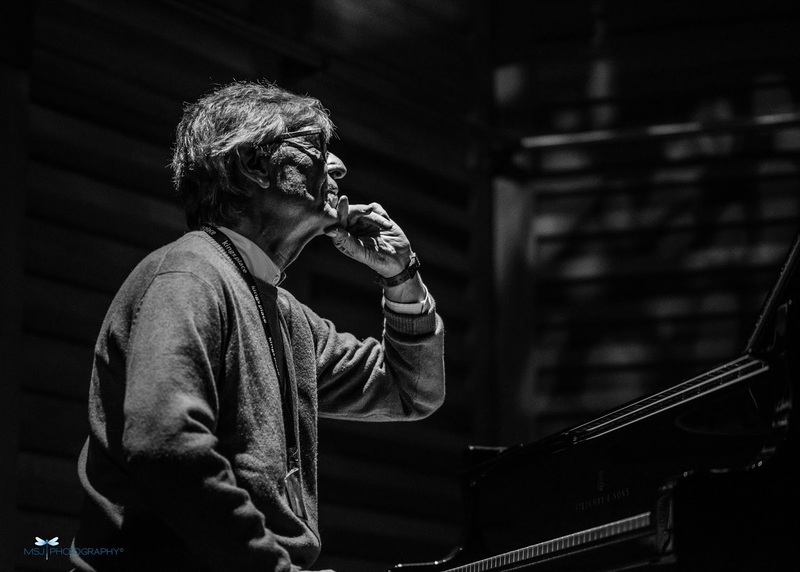 At Kings Place during the 2018 London Jazz Festival and as part of the Time Unwrapped season, the Darius Brubeck Quartet paid homage to the family business while at the same time demonstrating qualities and inspirations unique to themselves. “A lot of people inherit their father’s trade,” said Darius Brubeck, “but not many get to inherit a hit.” Blue Rondo à la Turk is a belter based around an additive time signature of 9/8 counted 2+2+2+3. Dave Brubeck heard the rhythm performed by Turkish street musicians, who said "This rhythm is to us what the blues is to you." The 9/8 is pretty much locked down and the soloing occurs over the louche 4/4 side theme which emerges as glorious relief from the Turkish yaygara. Take Five is said to be the best-selling jazz single of all time. Paul Desmond claimed Take Five was originally conceived not as a worldwide super-hit (is anything?) but simply as “a Joe Morello drum solo”. With Wesley Gibbens on the kit it’s a bit more developed than the original recording, moving more freely across the kit as you’d expect for someone playing a tune that is 59 years old rather than 0 years old. The group’s confidence, freedom and enjoyment make it almost like hearing this ubiquitous tune anew. 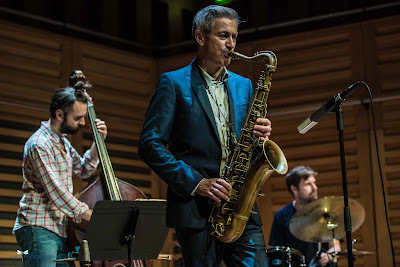 Saxophonist Dave O’Higgins has a pleasing looseness, and Matt Ridley an assured touch on the bass. During Brubeck’s piano solo he takes it on a really special journey through the keys, modal shifts that clearly show his ethnographic musical influences and that take it in an unexpected direction. Darius Brubeck majored in ethnomusicology and the history of religion at Wesleyan University. 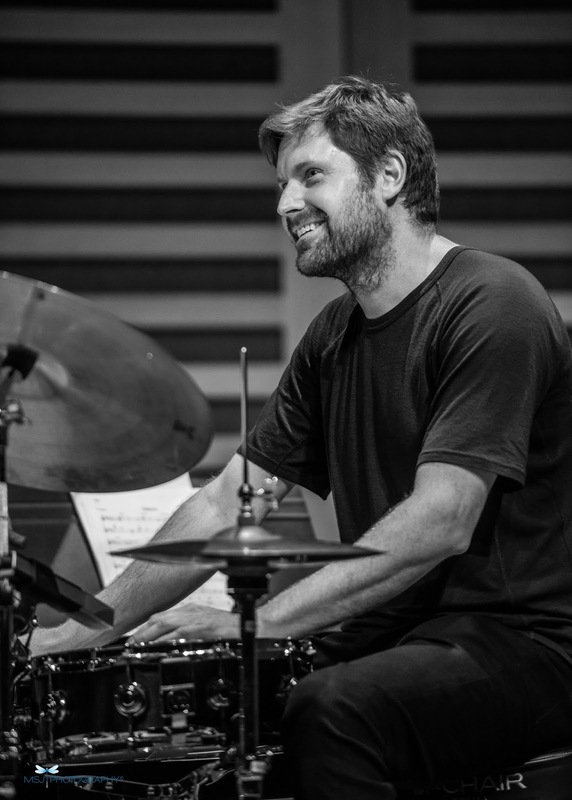 These influences, as well as his considerable time spent in South Africa, all enliven his approach to straight-ahead jazz. His father’s music is rooted in a blend of the cool and West Coast styles of the 1950s zhuzhed up with elements taken from his experience of travelling the world, but it feels like Darius’s own flips this: it’s rooted in world influences and uses straight-ahead jazz to get around. The group is fresh back in the UK from a 12-date seven-city tour of Poland, a commemoration and recreation of the Dave Brubeck Quartet’s 1958 tour. 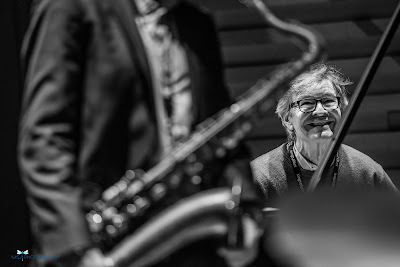 You might think of Brubeck with his cool style, specs and suits as a bit establishment now, but when he went to Poland jazz had only been un-banned three years before and was still very much a liberational music, and it still feels like that in Poland even today. Touring informed the 1958 album Jazz Impressions Of Eurasia, and of course Time Out. Darius was there in Poland 60 years ago, he says, “a boy from California behind the Iron Curtain”. Thank You (Dziekuje) was the last piece they performed on that tour, and at this concert. Dave Brubeck wrote this ballad after visiting Chopin’s house, which had miraculously avoided being bombed. It has convincing Chopinesque writing which Darius seemed really at home playing, more at home than when the tune heads back into the default straight-ahead jazz. His imagination seems to delight in the chromatic colorations of Chopin and classical as well as Asian and African influences even more than his father’s did. Darius Brubeck taught jazz in South Africa from 1983. He initiated the first degree course in Jazz Studies offered by an African university. From 1989 he was Director of the Centre for Jazz and Popular Music at the University of KwaZulu-Natal in Durban before leaving for London in 2005. His South African experience and interests were evident not only in his own compositions throughout but in two selections by two of the legends of South African jazz. Abdullah Ibrahim’s music fits his personality even more than with his father’s. Darius is inclined to mysterious and oneiric textures, though Dave Brubeck had his moments like 40 Days from the album Time In, a sombre piece in 5/4 time inspired by the story of Jesus in the desert. The plangent piano intro to Ibrahim’s Sakwe switches into a fast rumbling piano shuffle with and an opportunity for Wesley Gibbens to tickle the kit with the brushes at tempo. They dedicated Nomali to its composer Hugh Masekela, who died in January this year. All in all, it’s a class act. Issuing superlatives, you often hear that something is ‘the Rolls Royce of’ whatever kind of thing it is. The Bose Super Quad X is the Rolls Royce of sound systems, that sort of thing. I once heard that the advertising department of one manufacturer of automobiles got carried away and proclaimed that its new vehicle “really is the Rolls Royce of cars.” Regarding music, I could say that the Dave Brubeck Quartet was the Rolls Royce of jazz quartets, or better yet say that Darius Brubeck is the Dave Brubeck of jazz.